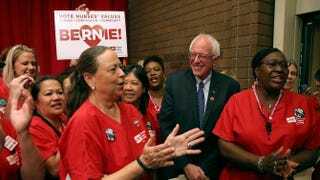 Sen. Bernie Sanders (I-Vt.) greets nurses as he arrives at a Brunch With Bernie campaign rally at the National Nurses United offices Aug. 10, 2015, in Oakland, Calif.
Let many a progressive pundit and New Hampshire poll tell it, and Bernie Sanders is catching fire. Raking in a cool $2 million postdebate, the Vermont senator is the hottest thing since his one-hit-wonder state compatriot, the former Gov. Howard Dean, in 2004. Look at other polls and he’s either catching up or “neck and neck” with Democratic-primary front-runner Hillary Clinton. But notice, that’s mostly Granite State hype, a place whose population is barely 1.5 percent black. The liberal bonfire fades into crackling embers once you throw a cold bucket of black votes on it. That’s one big reason a Washington Post-ABC News poll dropped today shows him stalled right where he was last month. Even after reversing himself on the significance of #BlackLivesMatter, the curmudgeon personification of progressive causes sweats uncomfortably once the Democratic primary puts virtually all-white Iowa and New Hampshire in its rearview and heads south for states electorally dominated by African Americans. 1. Bernie might be surging in the polls, but it’s his black polling numbers you should pay attention to. It’s not just today’s Washington Post-ABC News poll. As YouGov shows (pdf), more African Americans than any other major demographic group watched the Democratic debate—16 percent to only 15 percent of whites and 9 percent of Hispanics. More African Americans, 52 percent, say that Clinton won the debate over Sanders, at 13 percent. That’s much better than YouGov’s polling right before (pdf) the debate, when he got only 4 percent black support. He actually dropped from 8 percent black support in a previous Sept. 28 poll (pdf). And when that same poll also matched Sanders directly against Clinton, African Americans overwhelmingly picked Clinton at 84 percent to his 16 percent. Of course, a lot of this support is built on long-standing black loyalty to the Hill-Bill machine. Even when Public Policy Polling messed around (pdf) in early October with an “alternative Democratic primary” (throwing Al Gore, Michael Dukakis, Secretary of State John Kerry and Sen. Elizabeth Warren into the mix), black voters still picked Clinton over Sanders 47 percent to 15 percent. We cite YouGov and PPP because they do something that CNN and most other pollsters won’t do: actually acknowledge black voters as a powerful electoral segment. Still, even as the postdebate CNN-ORC poll (pdf) relied on a bizarre “nonwhite” voter category, 63 percent had a favorable opinion of Clinton, versus 40 percent for Sanders—and 56 percent for Vice President Joe Biden. 2. Bernie should watch more black pastors on Sunday. While it’s still anecdotal, the core of Sanders’ black-voter problem could be this: He’s too depressing. Comedian Larry David couldn’t resist the temptation in last week’s SNL skit to call out Sanders’ aggressive “the sky is falling” ethos. For sure, African-American voters generally love the public figures who claim to “keep it real” and cast rebellious shade at the “system.” But candidates who successfully woo black constituencies are those who can illustrate hope. As David Briggs of the Association of Religion Data Archives points out, the black community is the most religious: Christian church attendance is declining overall, but black church attendance remains solid, with 7 out of every 10 black Americans reading the Bible outside of church. Most major black political shifts or movements in America have never occurred without some form of black religious influence. Sanders may be under the impression that he can find enough black voters to circumvent that through heavy reliance on a newfound alliance with young black activists. Wrong. Sanders’ ultraprogressive movement can’t expect to galvanize black voters without the inspirational “call and response” found every Sunday at your local black church. Sanders might be courageously blunt, but his messaging doesn’t strike the casual observer as necessarily uplifting or anywhere near the motivational-speaker approach that black voters gravitate to. 3. It’s generational. Sanders, undoubtedly, draws enormous political and fundraising energy from the voting bloc every candidate wants: under-30 millennials. And yet, from what we’ve established, it’s been mostly young white progressives giving him that Bern boost, crowds of whom pack Sanders rallies or actively troll social media to thrash detractors. Some have observed that this is problematic. Apparently, this is one of a few tactical reasons behind Team Sanders’ frantic embrace of BLM. It’s also recognition that maybe the optics of too many aggressive white millennials’ public bashing of “disagreeable” black activists is not the best look once you hit heavily black Democratic stronghold states like South Carolina and Georgia. The current logic follows that with black activists now talking to—rather than crashing through—the Sanders campaign, black millennials should be just as ginned up about Sanders as white millennials, a notion fueled by a general perception that all black voters must be down with the cause. But it’s a lot more complicated than that. Voters of color, of course, will be key to candidate success in 2016, but age will also play a greater role as senior voters (those over 50) continue to make a bigger play because of reliability and consistency (after all, those 30 and above are nearly 67 percent of the overall electorate). Black millennial voters might give Sanders a chance as he hits blacker states, but there’s no guarantee that will help, since youth-voter turnout dropped 6 percentage points between 2008 and 2012 and was just a paltry 19.9 percent in the 2014 election. The open challenge for Sanders will be those older voters. As YouGov shows, support by age for Sanders drops large as the voter gets older, from 36 percent for ages 18-29 to 18 percent for those 45-64. That includes those black voters with all sorts of sentimental political attachments to a 24-year-old Clinton brand, something their kids wouldn’t know about.